Our Bounce Back Neighborhood is a 34 bed Medicare short-term rehab wing. Bounce Back is designed for those who need physical, occupational or speech therapy following a hospital stay. We offer private and semi-private Medicare Suites. In addition, we offer a private dining room and lounge area for visiting families. Our Bounce Back Neighborhood also features AJ’s Fitness Center, equipped with HUR state-of-the-art Strength Training Equipment, as well as a big TV with Wii access. There is also an Occupational Therapy area with a full kitchen and laundry. Our Bounce Back Therapy Team assists and encourages these individuals within their areas of need. 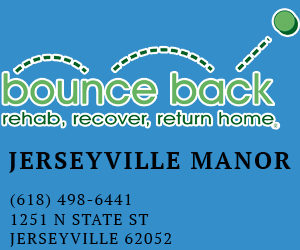 For those going home or those living at home, Jerseyville Manor also offers outpatient rehab. Brady Dabbs, Director of Marketing, states, “It is important today to let seniors know that they have a choice in where they go for rehabilitation. Just because they are in a hospital out of town doesn’t mean they can’t come back to Jerseyville for their rehab. Staying closer to home ensures visits from family and friends who might not otherwise be able to travel long distances. These visits mean a lot to those during the rehabilitation process.” For more information on Bounce Back Rehab please call Marcia at 618-498-6441. Garden Court is a special care unit designed for those with Alzheimer’s and other memory impairments. Garden Court offers a secure environment, specially trained staff, spacious suites, activity based programs and a secure courtyard with a walking path. Brady Dabbs, Director of Marketing, states, “The goal of Garden Court is to keep our residents at their highest functioning level. Particular emphasis is placed on exercise, personal hygiene and grooming, as well as nutritional management. Our residents’ safety, security and dignity are of upmost importance to us.” For more information you can call 618-498-6441. The Villas offer their owners the best of both worlds, a scenic location but yet close to all the conveniences of town. Villa owners enjoy more time with family and friends and live free from the stresses of lawn care and snow removal. The unique features of the Villas include spacious two-bedroom two-bathroom floor plans, attached two-car garage, included services package (lawn care & snow removal) and peaceful surroundings. There are several ready-to-build lots available for single family & duplex villas. For more information on our Villas or to schedule a showing, please call 618-946-7336.